Childbirth and Chipotle cravings have at least one thing in common: they can often come on at the most unexpected moments. Occasionally, they also happen to coincide with one another, as one Colorado woman discovered after she went into labor while stopping for a bite at her local Chipotle -- and ended up giving birth to a baby boy in the parking lot. 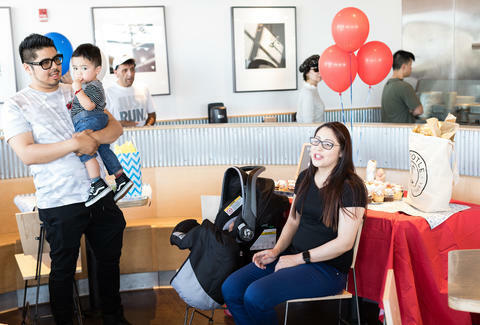 To celebrate the surprise delivery, the burrito chain decided to throw a baby shower for the parents of the newborn at the location where he came into the world. Brings a whole new (and literal) meaning to the idea of a "burrito baby," doesn't it? The party went down over the weekend, nearly a month to the day since the baby, Jaden Flores, was born when his mom Adriana went into labor and realized she wasn't going to make it to the hospital in time. It also marked the first time that Angie Schell, the 9-1-1 dispatcher who coached Adriana and Jaden's dad Saul through the delivery over the phone, met both the couple and the new baby. The burrito-slinging chain pulled out all the stops with balloons and a catering setup in the dining area of the restaurant, and even brought in a special dessert spread complete with burrito-themed cake and cupcakes. They also gifted Jaden a special tortilla wrap blanket. Little burrito, indeed. Chipotle actually organized the whole event as a surprise for the family, who thought they were just swinging by to "reunite" with Schell. "We are always looking to make our customers happy by going above and beyond and cultivating a sense of community," Chipotle PR and Communications Manager Quinn Kelsey told Food & Wine. "We do that every day for our customers through the real and really delicious food we serve, but sometimes this goes beyond the restaurant itself -- literally! When we heard that baby Jaden was born in our parking lot, and the amazing teamwork between the family and the dispatcher, we were excited to do something special to celebrate them all. 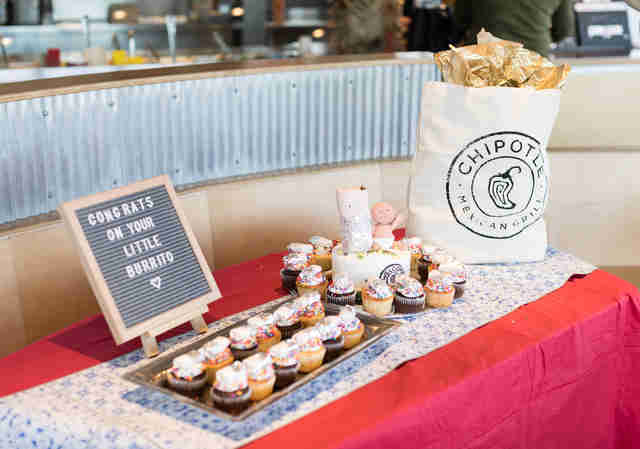 We loved throwing the Chipotle-themed baby shower and hope they enjoyed it just as much as we did." It turns out that Jaden isn't actually the only person in his family with a special connection to the fast-casual Mexican chain. In fact, his parents, who have three other children, actually met at a Chipotle. Kind of makes you wonder just what happy surprises are in store the next time they all stop by for some tacos.